I recently had the opportunity to take some good folks from FLIR Systems, Inc. into the woods for an overnight adventure. Most bigfooters know FLIR as the infrared and thermal imaging company that makes those nifty devices that most of us salivate over. Knowing that the FLIR folks would be taking an arsenal of their products out with us, I was quite excited about the trip. While out in the woods, we shot the following short promotional video for my upcoming speaking engagement at Inframation, the largest infrared camera-user's conference in the world. 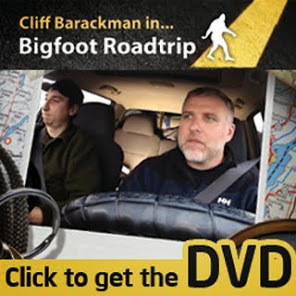 I will be speaking on November 6th on how I utilize FLIR thermal imagers in bigfooting. Over the course of the evening, we had some interesting yet ambiguous things happen. We did not capture images of bigfoots on camera, but at dusk we heard three possible power knocks from northwest of our location, and Jen and Haley heard what they described as deliberate branch breaking on their night walk around 11 pm. Having to work the next day, they left the location sometime after midnight, but I stayed there alone listening for the next couple hours. During the first hour after they left, I heard two knocks, the source of which seemed to be moving away from camp and back to the northwest. Ambiguous, I admit. Very cool, though. I love bigfooting. I had lunch with some of the IT guys from FLIR, and I suggested they should make a "Sasquatch Edition" camera. I think it's completely appropriate seeing as how they're a Portland company.